Cover the haddock with boiling water, and leave to stand for five minutes. Drain the fish, reserving the soaking liquid. Measure the soaking liquid and add enough extra water to make it up to 400ml. Skin and flake the haddock, removing any stray bones you come across, and set aside. In a large saucepan, melt 30g of the butter with the oil. Add the onion and cook gently until softened but not browned. Add the rice and the curry paste, and stir for one to two minutes. Pour in the measured cooking liquid, bring up to the boil, then reduce the heat down to a bare simmer and cover tightly. Leave to cook, without disturbing, for eight minutes, and then stir in the flaked haddock and the peas. Cover again and simmer for a further four to five minutes, until the rice is quite tender and has absorbed virtually all the liquid. If absolutely necessary, add a splash more hot water to prevent burning. Take the pan off the heat, dot the rice with the remaining butter, and then cover and let it stand for four minutes or so. Add the parsley, and stir this in lightly with a fork, fluffing up the grains of rice. Taste and adjust the seasoning, adding salt only if needed. 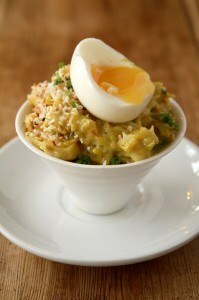 Top with a softly boiled, free-range egg (four minutes) and some toasted coconut.